WASHINGTON -- Former Senate Majority Leader Tom Daschle, whose office was a target of the anthrax attacks in 2001, said Sunday the suicide of the government's main suspect does not mean the case is over. The case re-emerged in the news this past week as investigators prepared to charge a government scientist Bruce Ivins in the case. Ivins died Tuesday in what has been ruled a suicide. Tom Ridge, Bush's Homeland Security secretary at the time of the anthrax attacks, said he did not know what evidence the FBI had uncovered against Ivins. "But I know that they were relentless, relentless, both domestically and overseas, both with the notion that it could have been a part of a broader terrorist network, but it could also have been the act of a deranged individual or two," Ridge said. 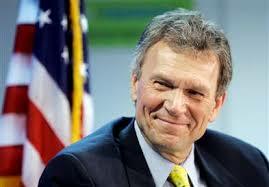 Daschle appeared on "Fox News Sunday," while Ridge was on "This Week" on ABC.